The fitness industry has seen a lot of new technologies arise and has had an influx of state-of-the-art training facilities pop up. Consequently, it’s hard to imagine that you can get a solid chest workout done with no bench and only a pair of dumbbells. But, believe me, you can! In this article, I’m going to tell you about 7 awesome dumbbell chest exercises that don’t require a bench! 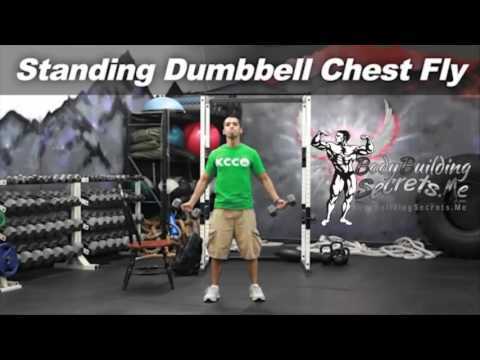 7 Dumbbell Chest Exercises: No Bench Needed! Read on to learn about these effective pectoral exercises that you can do with dumbbells. Later, you’ll also find an example workout that you can try which contains some of these exercises. Make sure you pay attention to the technique required as to prevent injury! Performing a press in a standing position targets your pectoral muscles in a unique way which creates new muscle growth and stimulation. To perform this exercise, you need only one dumbbell. Stand with feet shoulder width apart holding a dumbbell between your palms on bent arms in front of your chest. Squeeze the dumbbell with your palms to activate through the chest. Then push the dumbbell away from you until your arms are fully extended before returning to starting position. You need to watch out that as you fatigue, you don’t drop your arms. They need to stay in line with your chest when fully extended. Another important thing to note is that you ensure you keep your core engaged to avoid lower back stress as you push the weight away from you. This exercise is like a front raise that you would do for your shoulders, but with a simple twist of the wrists that makes it an effective chest exercise. For this one, you will require a dumbbell in each hand. Start in a neutral, grounded standing position with your dumbbells by your sides, palms facing forward. With a subtle bend locked in the elbow, lift both of your arms from your sides so the dumbbells meet at chest height. The reps up and down should be slow and controlled. Watch for unnecessary momentum that you may create to “swing” the weights up as opposed to lift them up. Core on, always. 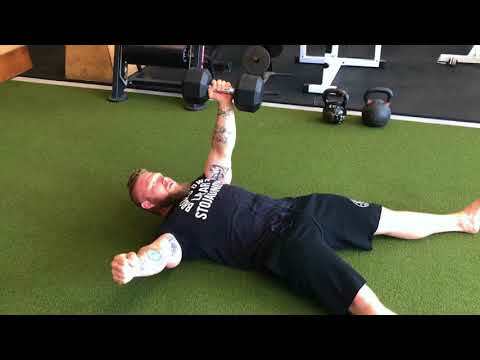 Pro tip: Do this as a unilateral exercise with one arm at a time or alternating from left to right for maximum effect! The key element of the reverse dumbbell press is the hand and wrist positioning. In a standard dumbbell chest press, you would grip the dumbbells with your palms facing forwards, away from you. In this exercise, you grip the dumbbells with your palms facing backwards, towards you. This small adjustment allows for your pectoral muscles to be targeted in a unique way. Lie on the ground with your knees bent and feet flat on the floor. Have a dumbbell in each hand with a reverse grip and position your arms at 45-degrees from your body. Press the weights up and together above your chest, squeezing the muscles at the top of the movement. Ensure that you place your arms back where they started (at 45-degrees from your body) at the end of each rep. It’s easy to assume a wider or narrower than required arm position if you get distracted during your set. This unique take on the push up will test your strength and stamina! There are several elements to this push up and it does require a reasonable amount of core strength and stability. Because of this, it’s not recommended for beginners. Go into push up position with each of your hands on a dumbbell, directly under your shoulders. Your palms should be facing inwards. Start by doing a push up. When you are back on extended arms, keeping your arm straight, lift one dumbbell off the ground and rotate until your body creates a ‘T’ shape. Each repetition should consist of a push up and a twist. This exercise is best performed in alternating reps from left to right. Be wary to not go too deep into your push ups with the added height the dumbbells provide, as this is not optimum for your shoulders. The dumbbell pull-over is often done with a bench. However, doing it with a stability ball adds an element of balance and stability work, making it extra challenging. Hold a dumbbell between your hands and start in a bridge position with your upper back supported by the stability ball. Your starting position should be with your arms extended above your chest. Then keeping your arms straight, lower the dumbbell behind your head until you feel a stretch in your latissimus dorsi. Whilst pulling the dumbbell back up to starting position, think about rotating your hands and arms inwards rather than outwards. This will allow for more activation through your chest than through your lats in this phase of the movement. Your core should stay well-engaged to support your neutral spine in avoiding going into hyperflexion when the weight is behind your head. This exercise is great for developing balanced strength and mass through the left and right sides of your chest. It also provides the opportunity to work on your core strength and stability as you add weight to one side of your body at a time. To perform this exercise, you need one dumbbell. Start by lying on your back with your legs out straight. Have the dumbbell in one hand with your arm placed at 45-degrees to your body; your other arm should be out wide (palm down) for added stability. It’s recommended that you commence with your weaker side when doing unilateral exercises. Press the weight up and down in a straight line. As you press the weight up, you will feel your core kick in to stop you from rolling over to the side of your body that is weighted. If you feel any stress in your lower back, you can bend your knees and have your feet flat on the floor – this variation requires less input from your core. 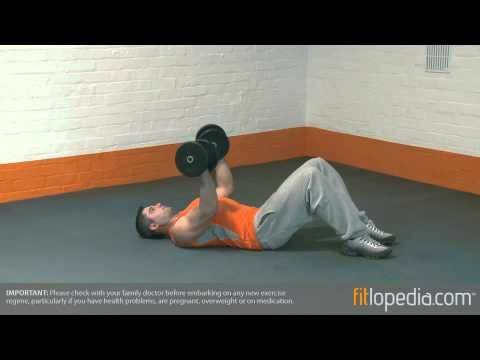 The dumbbell chest fly can be done in various ways without a bench. But this stability ball version is my favorite! Position your middle to upper back on the stability ball and have your knees bent with your feet flat on the floor. Push your hips upwards to get your body in as much of a flat position as possible. Start with the dumbbells together above your chest with a slight bend in your elbows. From here, open your arms out wide, until your arms are parallel to the floor. Then activating through the pectoral muscles, pull the dumbbells back together and give your muscles a good squeeze at the top of the movement. Doing this exercise on the floor will allow you to use more weight. However, doing it on the stability ball makes it more challenging in terms of balance and stability. Try out both! 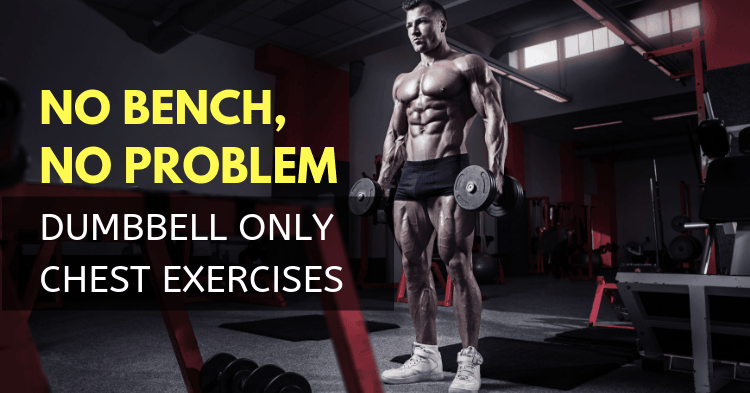 I’ve put together a workout that contains a few of the exercises I have covered in this article for you to try out. This workout is designed to hit your pectoral muscles from all angles and deliver a complete chest workout for developing strength and size. This workout is split into 3 supersets. Make sure you check out the videos provided in the exercise list. They will show you the right technique, so you can maximize the effect of this workout! It’s clear to see that you do not need a bench to do an effective chest workout. Most of the well-known and loved chest exercises that use a bench can be replicated by using the floor or a stability ball! A set of dumbbells in a variety of weights is a great starting point for being able to perform a range of exercises and workouts in the comfort of your home. If you’re looking for some dumbbells to be able to do exercises like these ones, you can check these out. Let us know about your favorite “no bench” dumbbell chest exercise in the comments section below!